About a year ago, my wife and I had a discussion. To be clear, we have had other discussions, both before and after this one, so please don’t get the impression that it’s the discussion itself that matters here. However, this discussion centred on how I was effectively filling up our house with books. I’ve always been a quick reader, and it was suggested that I was probably adding three yards of books each year to our collection, leading to capacity constraints (since I also hate throwing out anything at all). Good social scientist/pedant (this was the topic of another discussion) that I am, I decided I’d start to keep track of my reading during 2014. My original plan for this post was to run through what I’d read in detail, but as I sat in the kitchen on New Year’s Day, with a mild hangover, totting up the numbers, I felt that was all going to be too much like hard work, so instead I’ll give you the headline figures. First thing to note, was that my wife was wrong: I actually read a lot more than either of us thought. 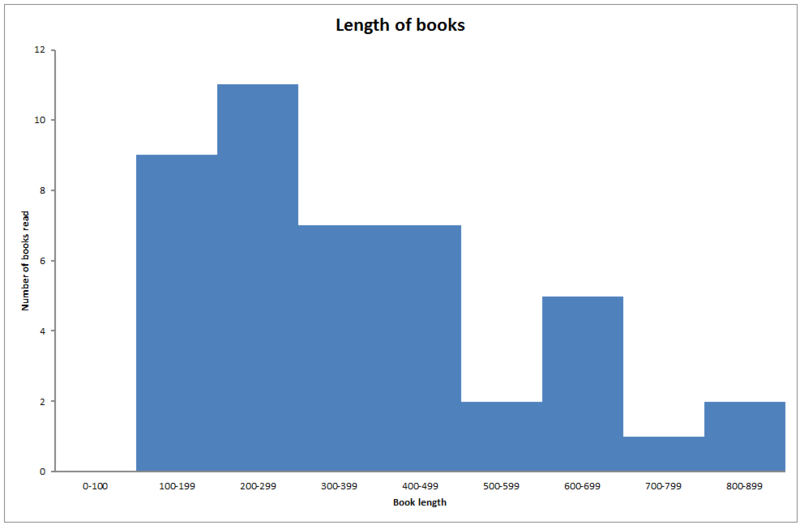 Last year, I read 45 books, with 17,714 pages of text, equivalent to about 48 pages every day. Plus every edition of The Economist, plus skimming innumerable journal articles, newspapers and other websites. A lot, in short. Of those books, I could very generously say that about a third were related to my work, albeit only a handful directly discussing politics and/or negotiation. Everything else ranged from Tudor whodunits and Risorgimento novellas to Californian oddities and people making journeys by bicycle to discover something about themselves. Quite possibly you don’t, but in keeping with the good values of active learning and reflection, I have come to appreciate that looking back is a useful exercise. I made more charts, but it got a bit out of hand, so I limit myself to this. I’m reminded of all the things I’ve read this past year, of wandering the muddy paths of Westeros, standing at the gates of Troy, considering how Serbian pig-farming caused the First World War, wondering about the geographical layout of Keflavik airport. I think of the people’s lives I encountered, from East German border guards, to fictional authors getting drunk at book-signings, poetical Canadian postmen and colonialist scientists obsessed with life on Mars. I also think about how my reading has shaped my life: handling office politics, creating new simulation games, planning trips to the US via Keflavik, etc. But beyond that, I have learnt something about myself and my tastes. Only 7 of the books I read were by women and only 1 is by a non-white author, which both surprised and unsettled me: if I want to know more of the world, perhaps I should try seeing more of it from the eyes of those different from me. So that’s a resolution for this year. Likewise, I’ve come to appreciate more the value of good writing: fair to say that one other reason for not listing all that I’ve read is that I’d have to say impolite things about some people’s work. Writing’s not easy, but it comes easier to some than others: there are other lines of work that people can stick to where their talents might be of more use. Finally, the process has reaffirmed to me the value of reflection. Rather than just joining the long, dusty lines of the hundreds of books that I’ve read in the past, I have spent time thinking on them. We can’t ask that of our students, if we don’t do it ourselves. What you chose to reflect upon is a personal decision, but it’s one that will pay for itself many times over. And now I have to go and find somewhere to stick all these books.